(Nanowerk News) Dr. Yves Bellouard of the Department of Mechanical Engineering is coordinator of a new European project, Femtoprint, to be started this month. The goal is to design a convenient 3D laser printer that will print microstructures in glass. With this ‘femtoprinter’ the manufacture of microstructures would no longer be the exclusive realm of big enterprises. Microsystems are minuscule machines, hardly visible with the naked eye. They often contain both mechanical and electric components and are used to measure signals, or to drive components. Increasing numbers of devices contain microsystems, like the accelerometers incorporated into laptops. These devices detect immediately when a laptop is falling and ensure that the hard disk is prepared for a shock, thus preventing loss of data. Another well-known microsystem is the so-called lab-on-a-chip, which can test a drop of blood, urine or saliva for pathogens or drugs. The manufacture of microsystems requires big, expensive and energy-guzzling machines as well as a special cleanroom. Bellouard holds this to be one of the reasons why the development of microsystems is relatively slow: only big companies have the requisite resources. Moreover, an investment does not become profitable until the market needs great quantities of these microsystems. This implies that small, innovative enterprises and applications that are too specialized hardly stand a chance. The Frenchman uses an alternative: the femtosecond laser with which he applies three-dimensional patterns in glass. The properties of the glass change in the areas that are exposed to the laser light, depending on the intensity of that light. Thus, the refractive index of the material, an important optical characteristic, can be adjusted. As a result, the selected pattern becomes a kind of road network for the conduction of light. This finding may be applied in optical computer chips, for instance, but also in optical motion sensors. In addition to the optical properties, the laser light can also influence the chemical properties of the glass, particularly its sensitivity to acids. The applied three-dimensional pattern can then simply be etched away in one go, whereas conventional methods still build up the patterns layer by layer. And as the pattern is applied in the interior of the glass, there is no contact with the air, so there is no cleanroom required. 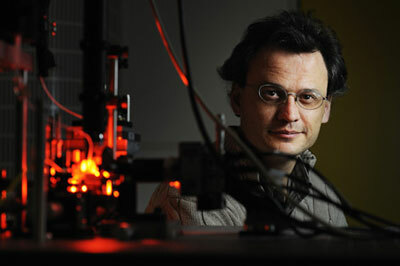 Bellouard and his colleagues have already proved that this method enables them to make the basis for a lab-on-a-chip. An important goal of Femtoprint is to reduce the required laser, which at present still occupies a laboratory table, to the size of a shoebox. The French laser manufacturer Amplitude Systèmes will be responsible for this part of the project. There are a number of French, Swiss, German and English partners involved as well. Bellouard’s group will focus mainly on the research into the effects of the laser light on ‘fused silica’, the high-grade glass that is used for the microsystems.